Thimbelina: A Hat for ..........? 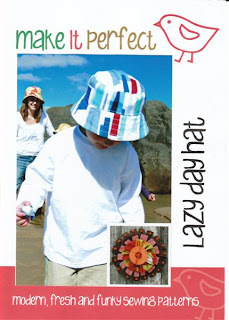 I've been itching to get time to whip up some hats for the kids using this "Lazy Day Hat" pattern from "Make it Perfect" that I bought a couple of weeks ago from Fabric Closet on Etsy. The hat I made today was originally for Miss 10 but it turned out a bit on the small size even though I made the Large which was meant for a 56cm head circumference..... Miss 10's head is 54cm. Not sure what/if I did anything wrong but will make the X-Large next time. Miss 10 was very disappointed that it was too snug and Master 7 was even more horrified disappointed that he got to wear it while I took photos of it.... being a GIRLS hat and all! The Horror! The hat is fully reversible which is great for matching with lots of outfits and I used two fabrics from the range "Lily Pond by Wendy Slotboom" which I also bought from "Fabric Closet". I'm sure it will make a nice pressie for some little girl and this makes finish number 4 for OPAM 2010! This made me LOL! Great hats, I love the bottom lip!